Also, First Things tweeted a 2012 piece by Michael Root entitled The Achievement of Wolfhart Pannenberg. These are the main ones I have seen floating around the internet thus far, and all are worth reading. I will offer my reflections in dialogue with theirs. All the responses rightly point to Pannenberg's towering intellect - others have pointed this out, but Pannenberg's daily work load (as recounted by Clayton) was so large it is hard to believe that anyone could do it. Also, most of them highlight the role Pannenberg's thought played in their lives outside of the academy (Derrick Peterson's post is a must read on this point, as he beautifully tied Pannenberg's thought and his personal narrative together). My story is very similar to some of those personal reflections. Though I was initially drawn to Barth and T.F. Torrance in my master's degree, Pannenberg was one of the first theologians that really gripped me after arriving at Luther Seminary and as I transitioned into doctoral work. Even as I later felt myself moving away from Pannenberg's thought some type of commitment remained, even if only out of nostalgia, as I would try to bait Matthew Frost into long arguments about the merits of Pannenberg. I was often successful, but only in the baiting. It is a strange thing to try to playfully and seriously help someone "see the light" when you really don't either. This is a personal illustration of another common thread among most of the responses to Pannenberg's passing - the difficulty in finding the best way to position oneself with respect to his thought. Like others who have read him I can't deny the impact he has had on me, yet Root's detailing of some of Pannenberg's convictions and how he lived them out are VERY problematic, to say the least. I've toyed with different ideas to correct or improve upon some aspects of his thought, even developing a dissertation idea or two that would be at least in part an attempt to do so, but despite real effort it remains difficult to see a way to make those changes without the whole structure unraveling. Does his excellence as a systematician (one of the top two of the "mid-twentieth century" according to Clayton) preclude making adjustments? More than one respondent has noted Pannenberg's frustration with Barth's "openness to change," but was he all that different? I will probably continue to wrestle with whether and/or in what way(s) Pannenberg's thought can be altered. So, like others who have written reflections, please permit me my own "Pannenberg-style eschatological riff" on this issue and say that we will have to wait and see. I am sad that Pannenberg has died and am profoundly grateful to have had his works to read and reflect on. Regardless of my conflicted relationship to his thinking he was a brilliant theologian, and I plan on continuing to wrestle with him in the future. Nice post, Derek. I'm guessing (or at least hoping) that what you find problematic about Pannenberg as detailed in Root's article is not what Root himself finds problematic. That article exemplifies everything wrong with the conservative turn in theology: it's fine that Pannenberg was homophobic, but it's a real shame he tried to be a theological virtuoso! Anyway, I was expecting more from this post only because of the title, which led me to think you were going to speculate about what his future might be in theology. It seemed like you were setting up a longer analysis about which aspects of his thought would survive and why, but then the post just ended. Will you be writing a follow-up? I'd like to second David's call for a follow-up theological reflection, too, Derek. And to spur such a thing, perhaps a bit of the old back and forth on Barth v Pannenberg might be useful. As a Lutheran theologian who dealt so directly with topical scientific concepts, Pannenberg is quite the influence at my school, mostly within the Religion and Science crowd. 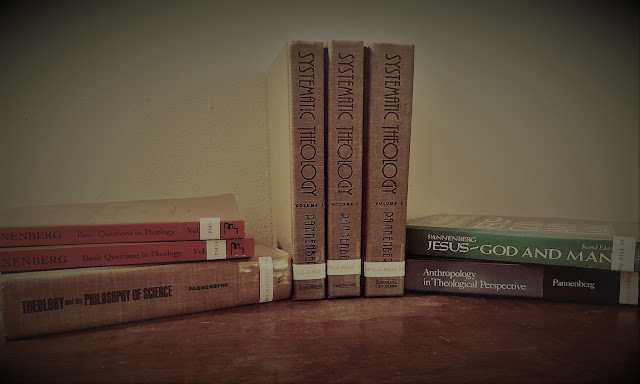 And, once upon a time, I read the Basic Questions series and the ST with relish ... though that was at about the same time as I had picked up my first Barth, and we know which path I chose. I appreciate Pannenberg's sense of provisionality, the sense that everything he writes is speculative, leaves and fruit when the procedural trunk and the soil it grows in are the important thing. He was willing to be wrong, but he expected to be able to say something useful with the tools at his disposal nonetheless. Of course, a Barthian doesn't need Pannenberg for that! But you're right about Pannenberg leaning into (and perhaps too often upon) the future. Pannenberg has a far more certain futurity than Barth, a way of reading redemption back into the present world that is the polar opposite of the way in which other theologians read creation forward into the world. However, I find that this leaves in him far less "openness to change," because he has chosen to be open instead to the world from a given (if speculative) theological framework. Barth's provisionality is predicated entirely on critically receiving the past and the present, within the limits of our providentially situated freedom, and he refuses to presume upon the eschatological future. Barth expects to be left behind by change, in a world that is not headed toward anything definite. The eschatological redemption is of a piece with the protological creation for Barth, but the entire realm of reconciliation in between does not lead anywhere; it is an end in itself. We will be redeemed, but we were made to be reconciled into right relationship. As a result, Pannenberg retains a distinct cachet among people who are looking to say something theological about the world around them, in light of Christ. I expect that he will continue to. That is the advantage to his "openness to the world." And what he has said is certainly preferable to the judgments we have more often tried to make about the world from the other end of things. 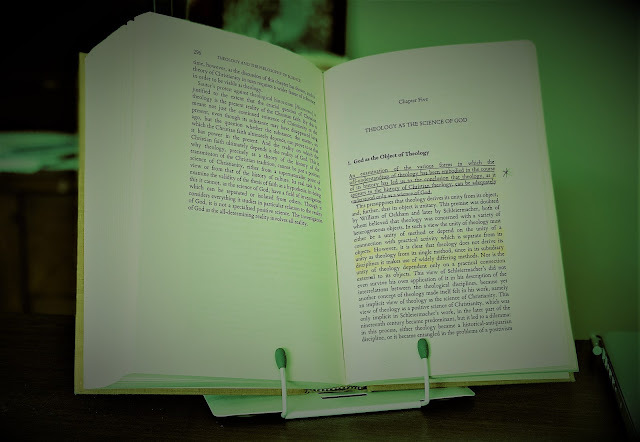 But if I'm going to leave apologetics to be the tentative and temporary leaves and fruit of a dogmatic enterprise, I would far rather concentrate on maintaining the trunk, as Barth does. Thanks for the comments David and Matt. I will try to write a follow up in the next day or two. Also, we are all in agreement about Root's piece. Arni, if you can't see that that brand of Catholicism aligns with no position so much as Western (especially US) political conservatism, you're not looking very hard. There are certainly traditional reasons that the most magisterial of all Western traditions leans toward a "conservative" rather than a radically reinterpretive schema, but Root (and FT in general) are not on about communal hermeneutics and the need for consensus fidelium. Re: the FT piece, I found the concerns David flags not to be so much because of conservatism so much as Catholicism and it's concern about theological and hermeneutic individualism (and happiness about conformity to trad Catholic ethics). "Happiness about conformity to trad Catholic ethics" seems a better way to put it. And that doesn't surprise me in the least from Root, who was a legalistic and revanchist Lutheran deeply concerned with conformity to "traditional" "Biblical" mores regarding marriage and sexuality before he became a revanchist Catholic in order to have magisterial sanction for his own personal theology. But it isn't about Catholicism; it's about morality. But, to get back close to on-topic, that's exactly why I suggested that Root was attempting to frame Pannenberg as acceptable to the First Things audience. The piece pitches Pannenberg as useful or acceptable or having made advances (the titular "achievement") because his theology gives their morality a leg to stand on. And then it goes into the problems with Pannenberg, which involve practically anything anyone else might look to as his real achievements. It is true that Pannenberg is radically reinterpretive. You simply can't have Pannenberg without his independent and critical free-thinking. If he were a Jesuit, he'd long since have been called before the Congregation, probably multiple times, because he is about rethinking the faith. But I find it disingenuous to put that first, and to say there's no politics involved, when the piece is written exactly the opposite way.